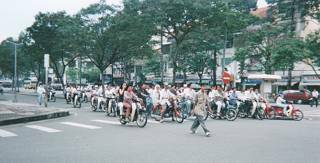 In Hochimin city, the "crowd" of motorcycles and bycycles waiting for traffic signal. Many people often said to me that I am very rare because I had never been to other countries just before the age of 30. One day I watched a preview of the movie in Vietnam which is very suspect beauty. That movie is the name "Cyclo" by the director Tran an yun lived in France. That movie got the award Benetia International Grand Prix. before. Hero is a boy workd as the simple taxi driver in Vietnam "Cyclo", Gang, and beautiful older sister and the story is spread in Ho Chi Minh. It is the first time for me that I am riveted to the preview of movies. I think that it is the chance. So I go to the minor movie "Cyclo". There are only a few visitors at the theater. That movie is very explicit view. So until the movie, some women went out. But I moved very much. It is very colorful, beautiful images, good music, very characteristic actors and actress... After the movie, I recognized that the movie is battle of sensibilities between the director and actors, actresses. This surprise is very simillar to surprise when I read the work by Osamu DAZAI "Ningen Shikkaku". "There is another world I have never known..."
Next night, I noticed that I was overpowered with this movie with reading a guidebook in the bed. After that I accessed the web page of this movie and downloaded only 1 minute preview of the movie taken over 45 minutes. After downloaded, I watched this movie time after time. I was looked ecstasy, maybe. And I used that movie as screen saver for my Macintosh. That movie must not produced in Ho Chi Minh, in Vietnam. I thought that this movie was produced only in Ho Chi Minh, in Vietnam. Next day I went to the bookstore to buy the Vietnamese text. Anyway I decided to go Vietnam. Only decided to go, but I was very happy, very excited. I must looked like a child who meet the longing star. Next page ..."2. Landing on Ho Chi Minh"
| TOP | Sitemap | Home Page | Back to "Memories in Vietnam"